The 563JH is a jacket with attached hood, snap front and a generous storm flap for added protection. 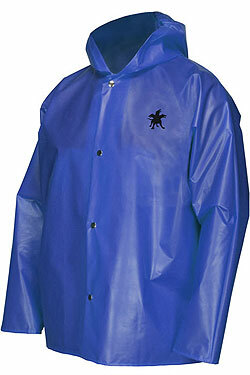 The hood features partial built in elastic for excellent fit. This TPU/Nylon material is light in weight, durable, and strong for outstanding wear. The TPU outer makes this a great option for food processing applications and is resistant to many oils, fats, and greases. Snaps are durable and metal detectable. This product was added to our catalog on Monday 31 December, 2018.